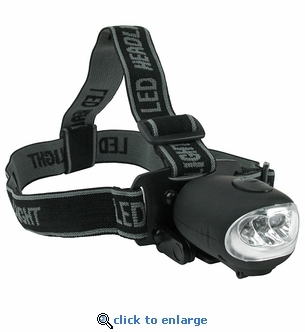 This hand crank headlamp will provide up to 90 minutes of hands free light. The adjustable headband allows the headlamp to fit on your head or over a hat. 3 LED lights with 3 settings: 1 bulb, 3 bulbs or 3 flashing emergency signal. 1 minute of winding gives you approximately 90 minutes of light with 1 LED bulb, or 40 minutes with all 3 bulbs.